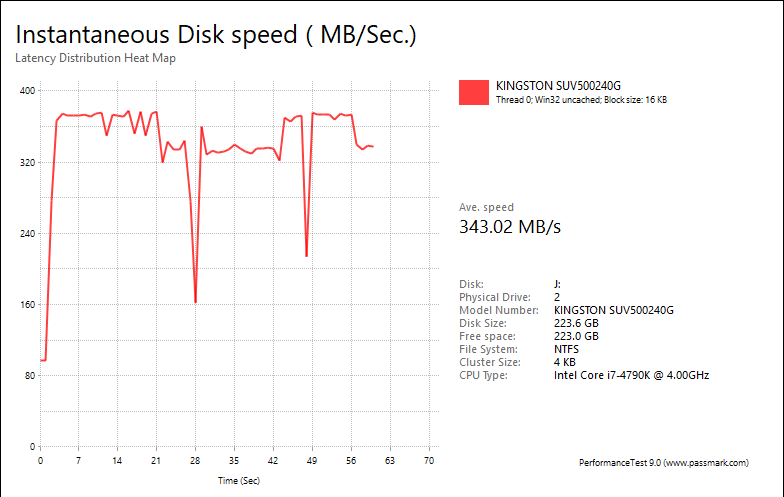 PassMark PerformanceTest 9.0's Advanced Disk Test, unlike HD Tune Pro 4.60, generates some awesome graphs right out of the box. It also provides valuable insight in simulating real world performance applications. To make things clear to you, the first graph simulates a database server, followed by a file server, web server, and workstation. Obviously, PassMark PerformanceTest 9.0 uses highly compressible data in most tests some controllers can really take advantage of. However, it also requires high IOPS capabilities for the best score. In the past, Marvell and Indilinx based drives perform pretty well in this test. 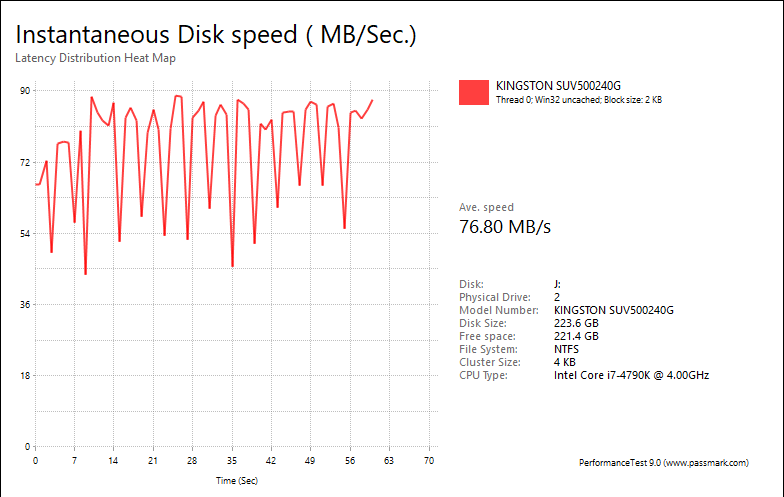 One thing clear is the Kingston UV500 240GB provided reasonably flat graphs, which is excellent if you are looking for consistent performance. Overall, this mSATA solid state drive's performance was acceptable, but fell behind the competition. With results of 76.80MB/s, 343.02MB/s, 422.85MB/s, 80.60MB/s, these scores were simply not that competitive against the latest budget drives, although the latter two figures were up a bit compared to the UV400. The UV400's numbers were 82.56MB/s, 340.70MB/s, 397.98MB/s, and 67.05MB/s. 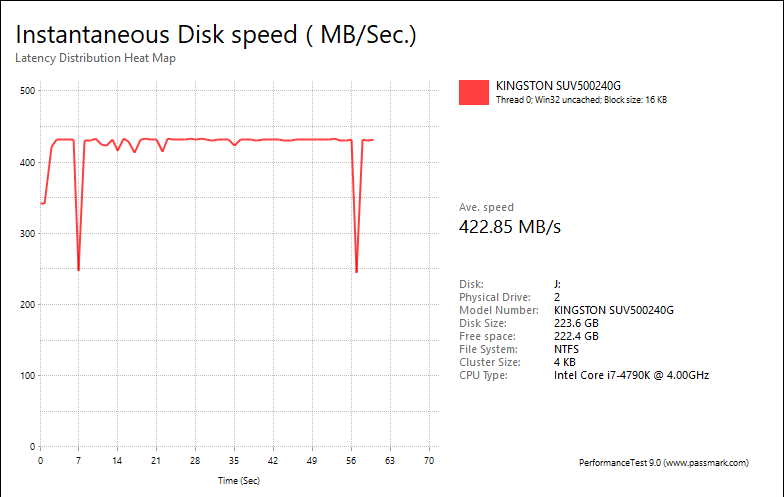 The Crucial MX500 500GB posted results of 155.76MB/s, 434.76MB/s, 488.07MB/s, and 73.11MB/s, in the same corresponding order. 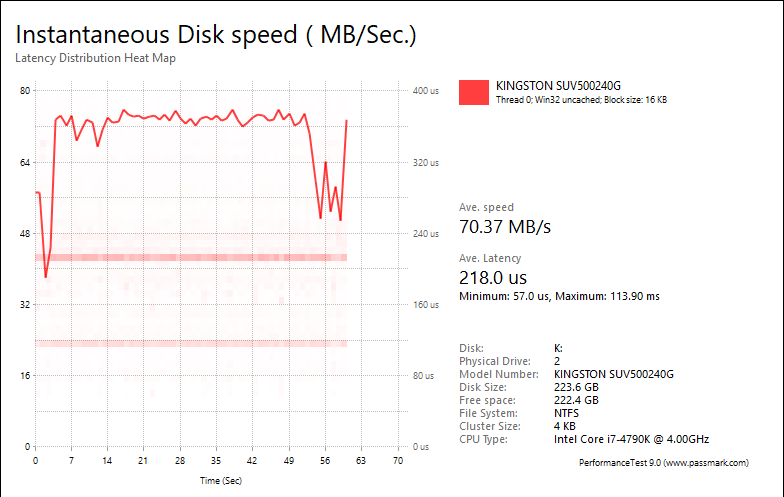 Meanwhile, the Crucial BX300 240GB was class-leading at 115.56MB/s, 432.77MB/s, 493.12MB/s, and 93.13 MB/s, respectively. posted 3 hours and 14 minutes ago, with 4 posts. posted 8 hours and 42 minutes ago, with 4 posts. posted 15 hours and 57 minutes ago, with 12 posts. posted 15 hours and 57 minutes ago, with 9 posts. posted 16 hours and 2 minutes ago, with 56 posts.